Bird lice is a blood sucking parasite which are usually found on birds like chickens, pigeons, starlings and sparrows. Bird lice is also known as bird mites and from the insect order of Phthiraptera. Fortunately for us bird lice do not carry any diseases. At some point in our lives we will have birds roosting in our eaves and roof voids and will get bird lice from time to time. Bird lice is just as much a pest as fleas and can create problems not only for your pet birds but can leave you seriously itching when the bird lice attach themselves on to you. Bird lice will inject their saliva into their host skin causing severe irritation of resulting in rashes and scratching like a mad man. Bird lice have a yellowish to greenish body but once fed will turn a reddish colour. Bird lice has eight legs for adults and six legs for immature bird lice. Bird lice are roughly 0.5 to 1.0mm in length. Bird lice have a life span about 7 days but can breed rapidly with the eggs hatching after three days. Bird lice will usually breed in the warmer months from Spring to Summer. Bird lice will go in search of new birds or their nest if their host has died or left their nest. What is bird lice and how do we get bird lice? Treatment for bird lice. First step is calling Redline Pest Control and speaking to a customer service agent. Redline Pest Control customer service agent will ask you a few questions to rule out other pest that may be in your home. Once Redline Pest Control customer service agent has ruled out other pest a technician will be assigned to you on a date that suits you. Your Redline Pest Control technician will inspect your roof void to see if there is any nesting material and will remove the nesting material. Depending on the entry points the technician will temporarily block holes and if the damage is extensive will advise you to contact a roof tiler. 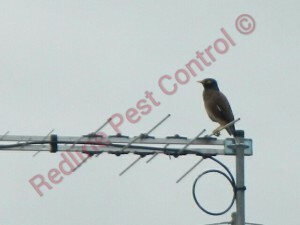 Your Redline Pest Control technician will dust your roof void after removing the birds nesting material and will let off smoke bombs in your home to kill off any bird lice that is in your home. Redline Pest Control implements a safe and effective service and will advise you of every step of the way.